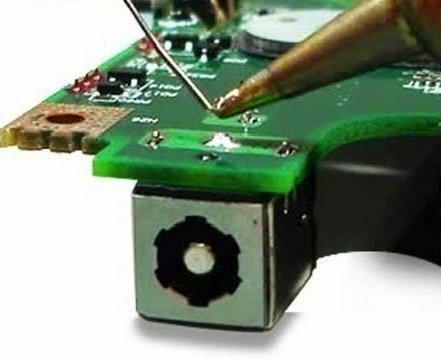 No matter how careful you are with your laptop, the power jack socket will eventually need a repair. Symptoms include – battery failing to charge and the need to hold the jack plug at a certain angle to enable charging. Not only are these inconvenient but eventually the socket will short out and a new motherboard will be required! It’s true to say that with most laptops this is not an easy job. It involves the careful disassembly of the laptop itself, the removal of the motherboard and some very skilful soldering! Trying to do-it-yourself often results in disaster, whereby the laptop becomes totally unusable! Don’t take that chance! At PC Partners we are fully qualified to safely disassemble your laptop and perform any soldering that is necessary. We carry a wide range of parts and the whole process usually takes 1-3 days. Urgent repairs are a speciality. Call us on 07771-525594 for a low quote.